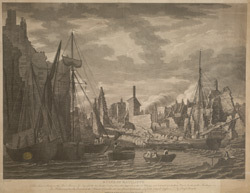 A note explains this print was "Taken a few days after the late dreadful Conflagration, which happened on the 23rd July 1794 and destroyed 453 dwelling Houses besides public Buildings". Ratcliffe was a riverside hamlet, situated in between the marshes of Wapping and the Isle of Dogs, was a useful landing area for river craft. To the south, there were wharves and warehouses of the East India Company and to the north, ships outfitters. In 1794, the terrible fire devastated the area leaving much of it in ruins.